Unfortunately for the parents in Alberta, the Government of Alberta voted against the Alberta Standard Time Act, the bill that, if passed, would have eliminated Daylight Savings. 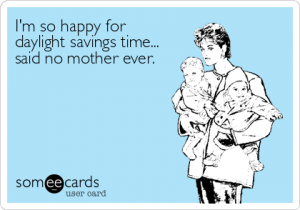 So here we are, another year of Daylight Savings playing havoc on our children! So, what’s the best way to approach this change? Experts recommend shifting the bedtime of children to 15 minutes later than their usual bedtime each night, starting on Wednesday, for the fall back of the clocks this coming Sunday. If you were not prepared for the change in time, then simply start doing it from Sunday night. There will of course be some disruption, but fear not, it will not last. It may be a challenging few days after the time change, but they will adjust!